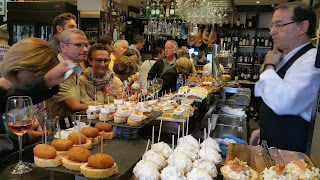 A lot of people ask me for advise on what to have really good pintxos in Bilbao. There many places, but to make it easier for your first visit, I will make a small list of 3 places you can do in a morning or an evening. Here you have the ABC of the biggest city of the Basque Country that you can taste in your first trip. A Sorginzulo. The Plaza Nueva Square is a charming pedestrian area that I love and also a center where you can enjoy lots of great pintxos in many bars, one that I like is this bar in a small corner of the square. Try here their great calamari. B Iruna Cafe. In Jardines de Albia square, you will find one of the oldest bars in Bilbao. 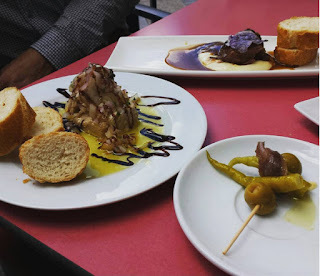 It is a charming bar with two areas: one more relaxed for a coffee or even to have lunch, and another standing up, where you can enjoy their freshly done specialty: the lamb pintxo. Delicious! C Victor Montes. It is one of the classics of the Plaza Nueva, you can try here the traditional codfish. The space and atmosphere is really unique. Of course, this is only a small selection, and there are many others from which you can choose: based on cheese, on codfish, on anchovies, on vegetables... Need more info? 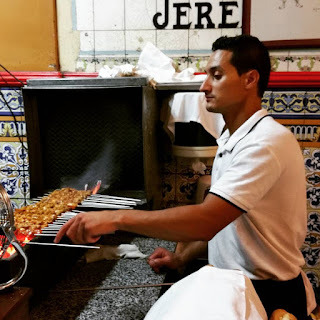 Aitor Delgado Basque Private Tour Guide can prepare a private tailored tour anywhere of the Basque Country, you can contact me through your Basque Private Tour Guide contact form.